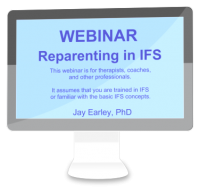 This webinar is for therapists, coaches, and other professionals. It assumes that you are trained in IFS or familiar with the basic IFS concepts. It covers the step in the IFS process where you give an exile a corrective emotional experience, which often involves the Self becoming the healthy parent for an exile.